Website, keyword research, SEO, and copywriting by Imagine That Creative help our client dominate search engine results in their niche. 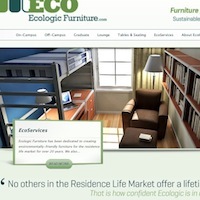 Ecologic Industries had an extensive and frequently updated catalog of eco-friendly student residence furniture, but no good way to share its product lines with the university dormitory managers who make furniture purchasing decisions. 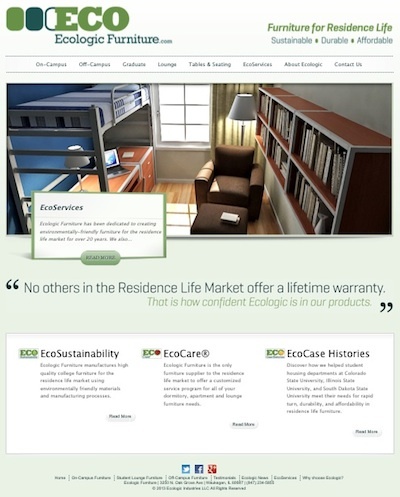 We recommended a CMS-based website, built on the WordPress platform, that would make it easy for the company to keep its catalog up-to-date. We chose and customized a WordPress theme, did keyword research, populated the site with hundreds of search engine optimized images and posts, and submitted it to search engines. Within weeks, the site had a Pagerank of 3 and was appearing on the first page of Google searches for the client’s top keywords. What’s more, the company’s product images dominated Google Image search results.